Yesterday was Alice's (Justin's maternal grandmother) funeral. It was a beautiful day weather- wise, so that was nice...today is a little chilly again. This was Kaitlin's first experience with a wake service and funeral. On Monday night, she seemed her usual self, even after viewing the body. During the rosary and wake service, she drew a little picture and wrote her name on it. Later, Justin told me that he had seen it in the casket after the service. Grandma Ruth must have helped her put it there...that was nice. There was a 'sharing' period at the wake and several people came up and said some really nice things about Alice. These are the kinds of things that really make you think, ya know? What will my family, my daughter, have to say about me one day. Really makes you want to strive to be a better person. At the funeral, Kaitlin did well until towards the last 10-15 minutes or so. All of the sudden, she got really quite and really cuddled up to me. Then, she wanted me to hold her and I realized that she was crying when she buried her face in my neck. 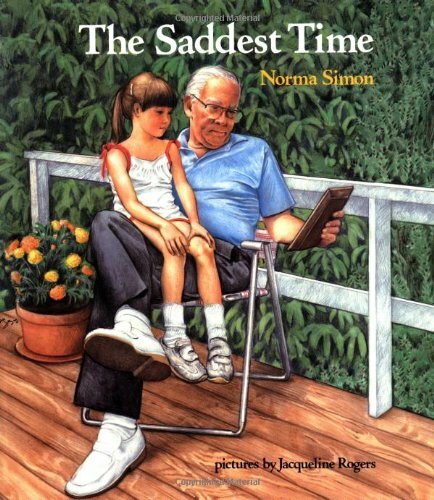 When I asked her what was wrong, she said in a whimpery little voice, "I'm sad for Grandma." It was sad and precious all at the same time. She continued to cry until after we got outside and got into Rahn and Ruth's car to ride to the cemetery. She was asking some questions about why Grandma Alice died and how her soul gets up to Heaven...tough questions. 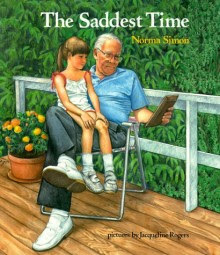 I bought a book on Amazon today called The Saddest Time by Norma Simon . It has good reviews so am anxious to get it and read it with her. It is supposed to explain death as the inevitable end of life and provides three situations (accident, illness, and death) in which children experience powerful emotions when someone close has died. I was hoping to find one that also touched on the religious (Heaven) aspect...not sure if this one does...may have to keep looking.